In 1958 Philip Jr. and Richard I. Coombe brought the first registered Aberdeen Angus cattle to the farm on South Hill, which had been in their family for two generations. Beginning with those first six cows, their purebred herd now numbers more than 300 head with 5 herd sires and numerous yearlings and calves. Members of the fifth generation of the Coombe family now assist with farm operations. 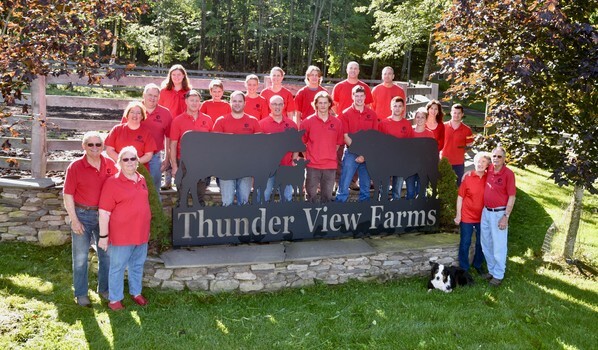 Thunder View Farms maintains a closed herd, isolated from outside animals except when a new herd sire is necessary. The cattle are nourished by the green grass and fresh water on our hilltop acres and briefly fattened by corn. We do not use antibiotics unless it is medically necessary, a very rare occurrence. No growth hormones are ever used. Our quality beef is completely wholesome, all natural, and additive-free. The meat is aged for at least two weeks and then custom cut, wrapped, and flash frozen in a USDA inspected facility. In 2009 we placed a permanent conservation easement on more than one half of our acreage to help ensure that the land will be protected from development while providing open space and environmental protection for New York City's water supply.